Marcus Tullio Cicero (106-43 B.C.) was one of the most influential political leaders in that powerful generation of Romans born around 100 B.C. along with his lifelong friend and sometime enemy Julius Caesar and his other great friend Pompey. But whatever power he exerted as a politician, it pales in comparison to his influence as a public speaker, a philosopher, and letter writer. His books have been read for two thousand years. And his collection of his letters is the most influential letters ever written in Western Civilization. Rome fights first Punic War (Punic= Phoenicia) with Carthage. Carthage controls coast of North Africa. Rome wins Sicily. Birth of Cato. Symbol of early Roman Republic. (virtue, simplicity, selflessness). Scipio Africanis vs. Hannibal. (Second Punic War). Success of plays of Plautus. Old Republican virtues. First Macedonian War. Rome vs. Greece. Old Republican Rome of Cato. (Cicero memorializes as great time). Scipio Africanis. Old Republican virtues. Greek philosophy comes to Rome.Polybius part of this "Greek" school. Death of Cato. (death of "old" Republic). Revolt of Gracchi (Populist revolt). Rome politics in trouble. Birth of Cicero. Birth of Pompey. Dictatorship of Sulla, Republic in crisis. Cicero and Caesar born into crisis. Success of young general Pompey. Rival to Julius Caesar. Birth of Virgil. Born near Mantua. Revolt of slaves under Spartacus. Pompey puts them down. 6000 crucified along Via Appia. Cicero elected Consul (key executive position of Roman constitution). Catiline Conspiracy (Dec).Cicero speaks for death penalty.Makes lifelong enemies in this attempted coup against the republic. Scandal of Clodius & Caesar's wife (Caesar divorces). Cicero makes more enemies with his wit (Clodius). First Triumvirate: Pompey, Caesar, Crassus. Caesar: Conquest of Gaul. Clodius effects exile of Cicero from Rome(to Greece). Invasion of Britain. Cicero: De Republica. Cicero pushed out of Rome. Goes to Cilicia as governor. (Jan 7) Senate passes ultimatum to Caesar: "Disband army." (Jan 10) Caesar crosses the Rubicon. (Mar) Caesar meets with Cicero, asks Cicero to join him. (Jun) Cicero turns against Caesar, joins Pompey . (Aug 9) Caesar defeats Pompey (Pharsalus, Greece). Pompey: 48,000 infantry, 7000 cavalry. Caesar: 22,000 infantry, 1000 cavalry. Plutarch: "Some few of the noblest Romans, standing as spectators outside the battle . . .could not but reflect to what a pass private ambition had brought the Empire . . .The whole flower and strength of the same city, meeting here in collision with itself, offered plain proof how blind and mad a thing human nature is when passion is aroused." Pompey flees to Egypt, murdered by Egyptians thinking this will gain them advantage with Caesar. Head presented to Caesar upon his arrival in Egypt.Caesar cries as contemplates sad end of his friend & competitor . Caesar with Cleopatra in Alexandria (makes her Queen of Egypt) .Cleopatra gives birth to Caesar's child. Later comes to Rome. (Sep) Caesar returns to Italy. Met at Taranto by Cicero, they make peace. (Oct) Caesar in Rome. Cicero "retires from politics." (Dec) beloved daughter Tullia dies. Caesar dines at Cicero's country home on Italian coast (see Letters). Ides of March. assass of Julius Caesar (Cicero present at theater). Brutus confers with Cicero, now grand old man of Roman politics.Cicero opposes idea of assass but approves after the fact, then laments nothing achieved by it. Cicero: De Senectute. Cicero: De Amicitia.Cicero: De Officiis (On Duties). Mark Antony seizes gov. (Aug)Cicero returns Rome, huge ovation, greeted by thousands as the only remaining Republican hero left in Rome, his moment of glory, greater fame and power than at any other time in his life . 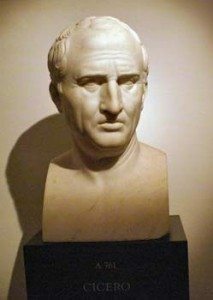 (Sep) Cicero launches First Philippic oration against Mark Antony.Cicero overnight becomes rallying point of old republican Rome.His enemy: Mark Antony. (Aug) Second Triumvirate: Mark Antony, Lepidus, Octavian. (Dec 7) Antony's men find Cicero, Cut off his head and hands and bring them to Forum in Rome. Mark Antony orders that they be nailed up in Forum Wants all to see within sight of Senate. And so ends the Republic of Rome. Battle of Actium. Octavian(Augustus) defeats Antony. Antony commits suicide thinking Cleopatra dead. Octavian in Alexandria, Cleopatra tries to seduce, then suicide. Octavian (Augustus) supreme, begin of "Roman Empire." Octavian becomes Caesar Augustus. Principate 27 BC to 14 AD . Death of Augustus. stepson Tiberius succeeds. Emperor Tiberias, stepson of Aug (wife Livia's son) succeeds Augustus. John the Baptist preaching, foreshadowing of message of Jesus of Nazareth. (April 3) Crucifixion. (see article, Humphreys, Nature: Dec 22 1983). Paul in Athens. Speading Christianity among the Gentiles. Nero succeeds Claudius. Becomes Emperor. Burning of Rome while Nero fiddles. Blame Christians, massive persecutions, executions. Death of Peter and Paul in Rome. Nero makes "artistic" tour of Greece. Rome still fascinated with Greece. Vespasian wins out as Emperor. Son of humble tax collector. Publicus Aelius Hadrianus (Hadrian) born into well-established family that originated in Picenum in Italy and settled in Italica, Hispania Baetica (the republican Hispania Ulterior), near present-day Seville. Trajan becomes Emperor, succeeding adoptive father Nerva. Rules 19 years. Greeted with enthusiasm, governed well, freed many who were unjustly imprisoned by Domitian, returned confiscated private property (process begun by Nerva). Best known for extensive public building program (Trajan's Forum, Trajan's Market, Trajan's Column), constructed with the spoils of conquest of Dacia, which ended in 106. His campaigns expanded the Roman Empire to its greatest territorial extent. Senate gave him the honorific of Optimus ("Best"). While sailing back to Rome, Trajan dies of a stroke in the city of Selinus. Deified by Senate, ashes laid to rest under Trajan's Column. Hadrian, adopted son of Trajan, becomes Emperor. Rules 21 years. Humanist and philhellene, sought to make Athens the cultural capital of the Empire and ordered the construction of many opulent temples in the city. Hadrian dies after adopting Antoninus Pius with proviso that Antonius adopt Marcus Aurelius and Lucius Verus in turn as his own successors.